Introduction: Many study results have suggested that infection by the Epstein-Barr virus is a possible agent of human breast cancer. But the role of Epstein-Barr virus in breast cancer is still controversial. 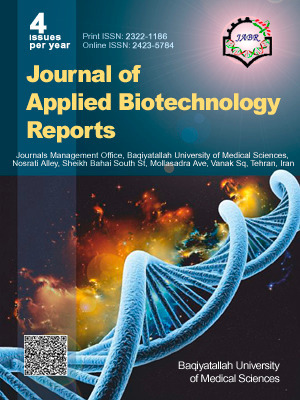 Materials and Methods: Paraffin embedded formalin fixed specimens were prepared from 40 breast and 40 healthy tissues in Khuzestan province of Iran. After DNA extraction, the purity of all DNA samples was evaluated by amplification of constitutive beta-actin gene. Then the presence of EBV gene in DNA extraction with appropriate purity was assessed by polymerase chain reaction (PCR) using virus specific primers. Results: only 2 out 39 cases of tumor (5.12%) and none of the 37 healthy samples were positive for the presence of Epstein-Barr virus. Statistically, Cramer’s index for EBV infection was 0.160 in cancer samples. Conclusions: Our results indicated that there is no significant relationship between breast cancer and Epstein-Barr virus. Further investigation on more patients needed to determine the exact relationship between EBV and breast cancer in this province. Tarver T. Cancer Facts & Figures 2012. American Cancer Society (ACS). J Consum Health Internet. 2012;16(3):366-367. doi:10.108 0/15398285.2012.701177. Harirchi I, Ebrahimi M, Zamani N, Jarvandi S, Montazeri A. Breast cancer in Iran: a review of 903 case records. Public Health. 2000;114(2):143-145. doi:10.1038/sj.ph.1900623. Heravi Karimovi M, Pourdehqan M, Jadid Milani M, Foroutan SK, Aieen F. Study of the effects of group counseling on quality of sexual life of patients with breast cancer under chemotherapy at Imam Khomeini Hospital. J Mazandaran Univ Med Sci. 2006;16(54):43-51. Parkin DM. The global health burden of infection-associated cancers in the year 2002. Int J Cancer. 2006;118(12):3030-3044. doi:10.1002/ijc.21731. Hoffman-Goetz L, Clarke JN. Quality of breast cancer sites on the World Wide Web. Can J Public Health. 2000;91(4):281-284. Lawson JS, Heng B. Viruses and breast cancer. Cancers (Basel). 2010;2(2):752-772. doi:10.3390/cancers2020752. Rickinson AB, Young LS, Rowe M. Influence of the Epstein-Barr virus nuclear antigen EBNA 2 on the growth phenotype of virus-transformed B cells. J Virol. 1987;61(5):1310-1317. Kieff E, Rickinson AB. Epstein-Barr virus and its replication. In: Knipe DM, Howley PM, eds. Fields Virology. Philadelphia: Lippincott Williams & Wilkins; 2001;2575-2627. Cohen JI. Epstein-Barr virus infection. N Engl J Med. 2000;343(7):481-492. doi:10.1056/nejm200008173430707. Speck P, Longnecker R. Infection of breast epithelial cells with Epstein-Barr virus via cell-to-cell contact. J Natl Cancer Inst. 2000;92(22):1849-1851. Chabay P, Preciado MV. Epidemiology of Epstein-Barr virus-associated pediatric lymphomas from Argentina. Bol Med Hosp Infant Mex. 2016;73(1):47-54. doi:10.1016/j. bmhimx.2015.12.002. Joshi D, Buehring GC. Are viruses associated with human breast cancer? Scrutinizing the molecular evidence. Breast Cancer Res Treat. 2012;135(1):1-15. doi:10.1007/s10549-011-1921-4. Labrecque LG, Barnes DM, Fentiman IS, Griffin BE. Epstein-Barr virus in epithelial cell tumors: a breast cancer study. Cancer Res. 1995;55(1):39-45. Chu JS, Chen CC, Chang KJ. In situ detection of Epstein-Barr virus in breast cancer. Cancer Lett. 1998;124(1):53-57. Preciado MV, Chabay PA, De Matteo EN, et al. Epstein-Barr virus in breast carcinoma in Argentina. Arch Pathol Lab Med. 2005;129(3):377-381. doi:10.1043/1543-2165(2005)1292.0.co;2. Mazouni C, Fina F, Romain S, et al. Epstein-Barr virus as a marker of biological aggressiveness in breast cancer. Br J Cancer. 2011;104(2):332-337. doi:10.1038/sj.bjc.6606048. Grinstein S, Preciado MV, Gattuso P, et al. Demonstration of Epstein-Barr virus in carcinomas of various sites. Cancer Res. 2002;62(17):4876-4878. Gaffey MJ, Frierson HF Jr., Mills SE, et al. Medullary carcinoma of the breast. Identification of lymphocyte subpopulations and their significance. Mod Pathol. 1993;6(6):721-728. Lawson JS, Salmons B, Glenn WK. Oncogenic Viruses and Breast Cancer: Mouse Mammary Tumor Virus (MMTV), Bovine Leukemia Virus (BLV), Human Papilloma Virus (HPV), and Epstein-Barr Virus (EBV). Front Oncol. 2018;8:1. doi:10.3389/fonc.2018.00001. Hu H, Luo ML, Desmedt C, et al. Epstein-Barr Virus Infection of Mammary Epithelial Cells Promotes Malignant Transformation. EBioMedicine. 2016;9:148-160. doi:10.1016/j. ebiom.2016.05.025. Szostek S, Zawilinska B, Kopec J, Kosz-Vnenchak M. Herpesviruses as possible cofactors in HPV-16-related oncogenesis. Acta Biochim Pol. 2009;56(2):337-342. Mant C, Hodgson S, Hobday R, D’Arrigo C, Cason J. A viral aetiology for breast cancer: time to re-examine the postulate. Intervirology. 2004;47(1):2-13. doi:10.1159/000076636. Hankinson SE, Colditz GA, Willett WC. Towards an integrated model for breast cancer etiology: the lifelong interplay of genes, lifestyle, and hormones. Breast Cancer Res. 2004;6(5):213-218. doi:10.1186/bcr921. Zhou XG, Sandvej K, Li PJ, et al. Epstein--Barr virus gene polymorphisms in Chinese Hodgkin’s disease cases and healthy donors: identification of three distinct virus variants. J Gen Virol. 2001;82(Pt 5):1157-1167. doi:10.1099/0022-1317-82-5-1157. Sugano N, Chen W, Roberts ML, Cooper NR. Epstein-Barr virus binding to CD21 activates the initial viral promoter via NF-kappaB induction. J Exp Med. 1997;186(5):731-737. Khan G, Philip PS, Al Ashari M, Houcinat Y, Daoud S. Localization of Epstein-Barr virus to infiltrating lymphocytes in breast carcinomas and not malignant cells. Exp Mol Pathol. 2011;91(1):466-470. doi:10.1016/j.yexmp.2011.04.018. Khan G, Philip PS, Al Ashari M. Is Epstein-Barr virus associated with aggressive forms of breast cancer? Br J Cancer. 2011;104(8):1362- 1363; author reply 1364. doi:10.1038/bjc.2011.99. Glaser SL, Hsu JL, Gulley ML. Epstein-Barr virus and breast cancer: state of the evidence for viral carcinogenesis. Cancer Epidemiol Biomarkers Prev. 2004;13(5):688-697. Fadavi P, Rostamian M, Arashkia A, Shafaghi B, Mahmoudzadeh- Niknam H. Epstein-barr virus may not be associated with breast cancer in Iranian patients. Oncol Discov. 2013;1(1):3. doi:10.7243/2052-6199-1-3. Morales-Sanchez A, Molina-Munoz T, Martinez-Lopez JL, et al. No association between Epstein-Barr Virus and Mouse Mammary Tumor Virus with breast cancer in Mexican women. Sci Rep. 2013;3:2970. doi:10.1038/srep02970. Perrigoue JG, den Boon JA, Friedl A, Newton MA, Ahlquist P, Sugden B. Lack of association between EBV and breast carcinoma. Cancer Epidemiol Biomarkers Prev. 2005;14(4):809-814. doi:10.1158/1055-9965.epi-04-0763. Eghbali M, Ghane M, Mirinargesi M, Zare Mehrjardi A. Detection of Epstein Barr Virus among Benign and Malignant Breast Tumors. Asian J Exp Biol Sci. 2012;5:365-371. doi:10.3923/ ajbs.2012.365.371. Kadivar M, Monabati A, Joulaee A, Hosseini N. Epstein-Barr virus and breast cancer: lack of evidence for an association in Iranian women. Pathol Oncol Res. 2011;17(3):489-492. doi:10.1007/ s12253-010-9325-z. Lawson JS, Gunzburg WH, Whitaker NJ. Viruses and human breast cancer. Future Microbiol. 2006;1(1):33-51. doi:10.2217/17460913.1.1.33. Hsu CR, Lu TM, Chin LW, Yang CC. Possible DNA viral factors of human breast cancer. Cancers (Basel). 2010;2(2):498-512. doi:10.3390/cancers2020498. Herrmann K, Niedobitek G. Lack of evidence for an association of Epstein-Barr virus infection with breast carcinoma. Breast Cancer Res. 2003;5(1):R13-17. doi:10.1186/bcr561. Tsai JH, Tsai CH, Cheng MH, Lin SJ, Xu FL, Yang CC. Association of viral factors with non-familial breast cancer in Taiwan by comparison with non-cancerous, fibroadenoma, and thyroid tumor tissues. J Med Virol. 2005;75(2):276-281. doi:10.1002/ jmv.20267. Chu PG, Chang KL, Chen YY, Chen WG, Weiss LM. No significant association of Epstein-Barr virus infection with invasive breast carcinoma. Am J Pathol. 2001;159(2):571-578. doi:10.1016/ s0002-9440(10)61728-2. Kazemi Aghdam M, Nadji SA, Khoddami M, Baghizadeh Dezfuli H, Khademi Y. Epstein-Barr Virus and Breast Carcinoma in Iran. Jundishapur J Microbiol. 2017;10(10):e12800. doi:10.5812/ jjm.12800. Glenn WK, Heng B, Delprado W, Iacopetta B, Whitaker NJ, Lawson JS. Epstein-Barr virus, human papillomavirus and mouse mammary tumour virus as multiple viruses in breast cancer. PLoS One. 2012;7(11):e48788. doi:10.1371/journal.pone.0048788. Richardson AK, Currie MJ, Robinson BA, et al. Cytomegalovirus and Epstein-Barr virus in breast cancer. PLoS One. 2015;10(2):e0118989. doi:10.1371/journal.pone.0118989. Mouh FZ, Mzibri ME, Slaoui M, Amrani M. Recent Progress in Triple Negative Breast Cancer Research. Asian Pac J Cancer Prev. 2016;17(4):1595-1608. Moore PS, Chang Y. Common Commensal Cancer Viruses. PLoS Pathog. 2017;13(1):e1006078. doi:10.1371/journal. ppat.1006078. Masrour-Roudsari J, Ebrahimpour S. Causal role of infectious agents in cancer: An overview. Caspian J Intern Med. 2017;8(3):153-158. doi:10.22088/cjim.8.3.153. Sixbey JW, Lemon SM, Pagano JS. A second site for Epstein-Barr virus shedding: the uterine cervix. Lancet. 1986;2(8516):1122- 1124.